Have you ever wondered how safe your dry cleaning is? Probably not. It’s not something that most people think about. Most dry cleaners use perc (aka: tetrachloroethylene – a human carcinogen). It’s a petroleum-based cleaner that often leaves a strange smell on your clothes after they’ve been cleaned. When a person is exposed to perc, it can enter your bloodstream through your skin or through breathing it in, and can cause many health issues, ranging from cancer to eye problems. This is dangerous for both workers and customers at dry cleaners around the world. It’s a concern for doctors, the EPA, and even OSHA! Not just that, dry cleaners who advertise as “organic” can use perc as well! Read our article here on the difference between organic and non-toxic when it comes to dry cleaning. Here at Crest Advanced Dry Cleaners, we are very careful to use safe chemicals. We use the EcoTech System (read more about it here!) 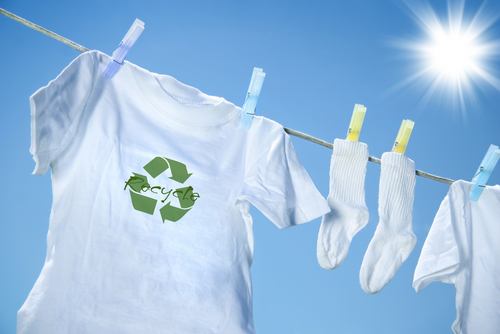 which uses a non-toxic, silicone solvent that is odor-free to clean your clothes. Not only that, we are earth-friendly in our operations as a whole, following the EcoTech System. We use a tagless labeling system, saving on paper. We also send home clothing in re-usable garment bags, rather than plastic ones that just get thrown in the trash. Additionally, we invite the community to participate in our hanger recycling program. If you ask for a hanger caddy, you can start collecting clothing hangers yourself! Our free delivery and pick-up service also helps the environment by reducing the number of unnecessary car rides. Our drivers efficiently pick up and drop off multiple bags of laundry, saving gasoline and reducing fuel emissions, one tank at a time. Our customers also love the added convenience! Our goal is to provide you with a safe dry cleaning experience, and to reduce the amount of excess waste that pollutes the environment around us. Feel free to talk to us about how you can join us on our mission to a cleaner and safer planet! Crest Advanced Dry Cleaners uses eco-friendly solutions to get rid of stains and professionally clean all types of garments. If you’d like to get your clothes dry cleaned, call us at 888-714-0070 or fill out our quick contact form here. Remember to ask about free pick-up and delivery!